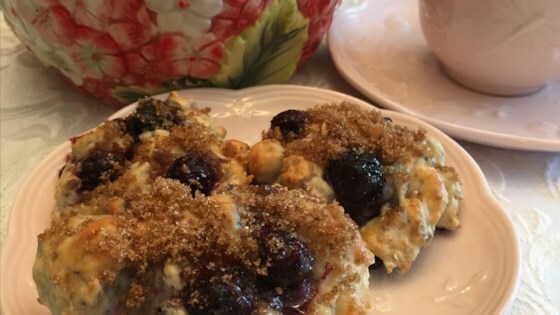 "A healthy, fast, and tasty way to use up leftover Bisquick® mix --- which is just what I did upon returning from a canoe/camping trip from which we were able to bring home bags of wild blueberries. Especially nice alongside a cheese soup." Combine baking mix, oats, milk, and hemp seeds in a bowl; stir until dough forms a ball. Fold in blueberries until evenly distributed. Drop heaping teaspoonfuls of dough onto an ungreased baking sheet. Bake in the preheated oven until golden brown, 8 to 10 minutes. Brush each biscuit with melted butter; sprinkle with brown sugar. See how to make big bakery-style blueberry muffins! Substitute margarine for the butter if desired. If dough is too wet in step 1, add more baking mix or oats gradually until consistency thickens.